Unauthorized access is forbidden and is punished by demotion or possible termination at the discretion of the Stability and Integrity Commission. If you have acquired this document in error, dispose of the file and abandon this terminal immediately. 3D modelling of RPC-991. Not to scale. Containment Protocols: Moved from Site-001. RPC-991 is kept at Site-016 and must be guarded 24/7 by two ASF personnel, as the Church of Malthus has displayed a high amount of interest in RPC-991. The 6-digit passcode to the gate of the containment chamber of RPC-991 must be reset every week and must have no similarities to the previous passcode. RPC-991 must be disabled at all times to conserve the mass amounts of energy it requires to operate. Modification of RPC-991 is strictly forbidden and will result in proper reprimands and possible demotion. Description: RPC-991 is a complex temporal mechanism known as the "Chronovisor", first created by Italian Roman Catholic priest and scientist, Pellegrino Ernetti, who had allegedly held a degree in quantum physics. It stands at a height of 2.7 meters with a width of 1.4 meters. Believed to have been invented in the early 1960s, the first project of RPC-991 was claimed to have been able to view events that had occurred in the past as far as biblical times. It is unknown if the first version of RPC-991 was indeed able to perform such a task. Despite the enigma surrounding the original chronovisor, RPC-991 has been confirmed to be able to perform the task of viewing past events that occurred even before Mesopotamian times and as far as the Devonian1 era, and had as well allowed the Authority to observe the crucifixion of Jesus Christ. The Church of Malthus has been confirmed to have attempted numerous raids on Site-001, the previous containment site for RPC-991, in an attempt to capture RPC-991. The reason as to why the Church has significant interest in RPC-991 is unknown, though it is believed they may use it to view catastrophes in evolutionary periods such as the Carboniferous Rainforest Collapse2 in hopes of developing strategies to achieve their main goal. Outcome: 10 Malthus Agents intruded into Aquatic Sector via one submarine. The airlock door into the Aquatic Sector was sabotaged, loosely installed into the outer walls. The agents then proceeded to the Alpha Sector in search of RPC-991, where a researcher had reported the intruders. 14 ASF personnel gunned down the agents on sight. Outcome: 10 Malthus Agents intruded the Terran Sector with 10 other agents entering the Aquatic Sector. The agents in the Terran Sector had begun to attack multiple personnel while the agents in the Aquatic Sector proceeded to search for RPC-991. The site entered a full-site lock down, closing the entrances and exits. Remaining 29 ASF personnel terminated the Malthus agents. We need to get the machine out of Site-001 immediately. The Church already knows where it is. Requesting the transportation of 991 to Site-016. The Church is tenacious, they're only going to continue raiding our facility until that device is in their hands. Alleged image of the crucifixion of Jesus Christ produced by the original chronovisor, reported in the May 2, 1972 La Domenica del Corriere issue. RPC-991 possesses two large capacitors responsible for the analysis of electromagnetic radiation, which is received by a pipe guarded with a valve, located at the top of the mechanism above the world globe. 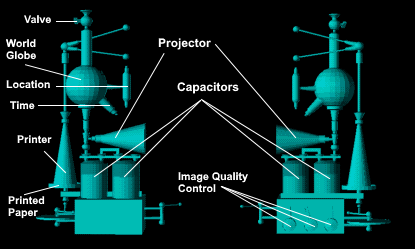 A projector is as well equipped, which is not only able to project images, but has proven to be capable of displaying animated frames of events, which however have a relatively low frame-rate. Images projected can as well be printed onto a piece of printer paper. On the left side of the base of RPC-991 are three rotary switches which are able to control the quality of the image produced. The first switch controls the contrast of the image, the second controlling the definition and the third controlling the frame-rate. The entire machine uses a massive amount of energy, and as such, RPC-991 is to be operated so that as much energy is conserved as possible. Addendum: During a second investigation of the recovery-site of RPC-991, a secondary component (RPC-991-2) was discovered. It has proven to be able to be properly attached to RPC-991. 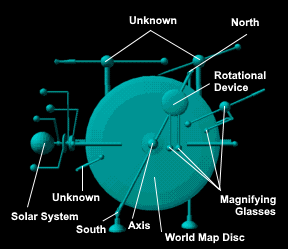 It is a circular disc with multiple levers, a replica of the four terrestrial planets (Mercury, Venus, Earth, Mars), a small disc with two magnifying glasses attached, a rotational device also equipped with a magnifying glass, and an axis with a south and north pole. The entire component is 0.4 meters wide and 0.4 meters tall. The main disc as well has a world map printed on it. The magnifying-glass equipment can be rotated 360°. There are however four components with unknown purposes, one being the solar system model, though the solar system model may be responsible for the selected year as for every time the model is rotated, a number indicator increases or decreases depending on the direction of the rotation. RPC-991 is capable of functioning without RPC-991-2. RPC-991-2 is believed to simply be a device used to select more accurate locations and times. No other functioning replicas of RPC-991 have been found since its containment. 1. Significant evolutionary period which had occurred 419.2 million years ago, marking the time when terrestrial life had been established. 2. A minor extinction event in the Carboniferous period which is believed to have separated forests into 'islands', causing dwarfism and extinction of animal/plant species.